A Beginner’s Guide to War Thunder – Other Game Modes | Killed in a Smiling Accident. These guides are aimed at getting a new player up and running in Arcade mode, a whirling maelstrom of instant action. 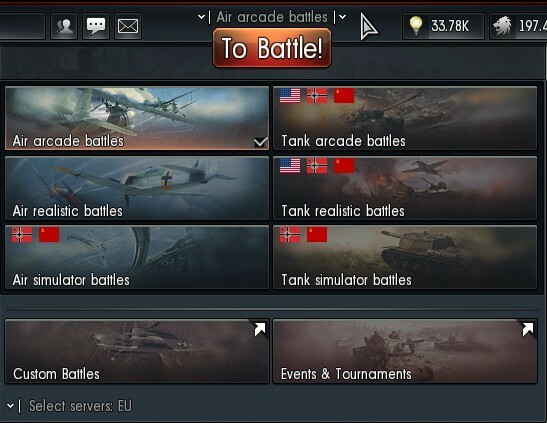 If you’re seeking more realistic and considered gameplay, you might want to step up at least to Realistic Battles by clicking over the “To Battle” button to bring up the mode selection window. In Realistic mode you can still fly with a mouse and keyboard quite easily, the Instructor takes care of the basic flying, and you can stay in third person view, but you won’t be able to get away with the really silly stuff from Arcade mode like vertical dive bombing from 30,000 feet in a heavy bomber; exceed the maximum speed or G-force rating for your aircraft and you’ll tear its wings off. You’re limited to one aircraft, no respawns, so choose carefully, and bombs and ammunition don’t reload in flight, you have to return to your airfield and land. Realistic Battles are based on either real or alternate history scenarios with one or two countries per team (e.g. Germany vs the Soviet Union or Japan vs Britain). If you’d like to give it a try, I’ve whipped up another quick guide (it’s from before update 1.37, when Realistic Battles were known as Historical Battles, but the general principles still hold). If that’s still not real enough for you then there’s another mode after that, Simulator Battles, no assistance at all with flying, targets aren’t marked on screen, you get to control the prop pitch and mixture and trim and magneto positions and… I tried a test flight in Simulator mode, and very nearly made it to the end of the runway before crashing. OK, that’s a wild exaggeration, I got nowhere near the end of the runway before crashing. If you’re ready for Simulation Battles you’re well beyond the scope of beginner’s guides, good luck to you! One rather interesting thing is that the game supports head or face tracking hardware that allows you to look around in the game by… looking around. I gather this works in all modes, but is probably most useful in Simulation when you’re locked to the cockpit view, it’s not something I’ve tried myself but I gather FaceTrackNoIR is one of the popular options. It will also support the Oculus Rift, which could be rather fun when they come to market. At the bottom of the mode window, “Custom Battles” allows you to either set up or join Custom Battles, as the name rather suggests; if you’re setting up the battle you have control over a wide range of parameters and can either set a password or leave the match open to anyone, ideal for having a blast with a few friends. Next to that, “Events and Tournaments” opens the Events list; typically there are a couple of events each day that offer a specific historical scenario such as the attack on Pearl Harbor or the Battle of Britain, with participation limited to historically appropriate vehicles. If you’re keen on history you may wish to give these a try, though be sure to pay attention to the game mode before joining (usually there’s one Realistic and one Simulator event). If you’re not so keen on player vs player combat you can fly missions or campaigns against AI opponents; under “Menu” in the top left you have a choice of Single Missions, Dynamic Campaigns or Historical Campaigns.